Stephen Webster’s jewellery is amongst the most glamorous fine jewellery being made in London today, his status underlined and enhanced by celebrity customers which include Madonna, Elton John and Tracey Emin. His success is international, with shops in London, Beverley Hills, Kiev, Moscow and St Petersburg. His innovative and distinctive designs, noted for their fine lines and unexpected subject matter, have won many awards. They combine precious materials with technical rigour and attention to detail in a very distinctive and contemporary expression of luxury. This bracelet reflects Webster’s long-standing fascination with the sea and marine life. Its swirling form is cast in titanium and this difficult metal also forms the settings for the gems. It is a sumptuous example of his style, dramatic in outline and subtle in colour – the black spinels, blue sapphires and white diamonds toning elegantly with the dark blue of the titanium. His website notes that his jewellery is ‘founded upon 38 years of exquisite craftsmanship and fearless creativity’. The skills he initially learned at Medway College were honed in the trade both in the UK and Canada. In addition to his own brand, Webster has been the creative director of Garrard & Co. since 2008, and in 2013 was awarded an M.B.E. for services to training and skills in the British jewellery industry. 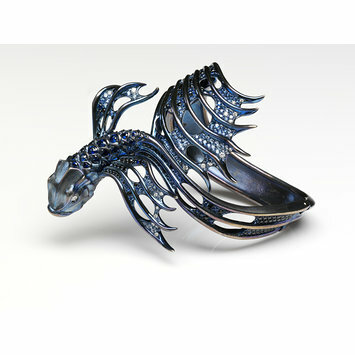 An exotic fish of dark blue titanium set with sapphire scales and diamond eyes. Its rippling fins and the long tail which forms the bracelet band have areas of openwork and gem-set areas which shade from black spinels, through dark and pale blue sapphires, to white diamonds. On the side opposite the hinge is catch in the form of a tiny fish. The bracelet with a companion brooch was exhibited in Selfridge's Wonder Room in May 2011 as part of Selfridge's green campaign 'Project Ocean'. 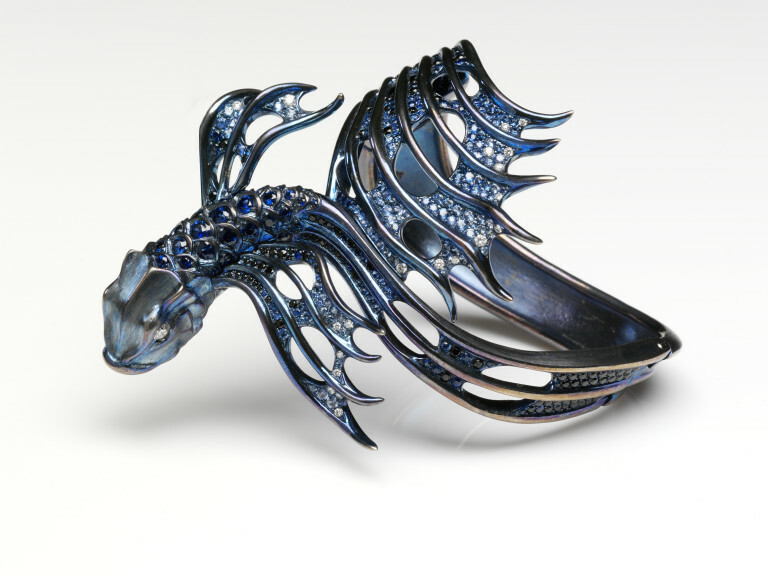 'Fighting Fish' bracelet by Stephen Webster; titanium set with sapphires, diamonds and black spinels; and case. England, 2009.